When Jake loses the five red fish off his favourite shirt, he finds them in the sky, ducking and diving in and out of the clouds. Jake cant catch his fish with a crooked copper nail, or tempt them down with food, or grab them in his hands. Then Jake learns the magical power of wo... read full description below. When Jake loses the five red fish off his favourite shirt, he finds them in the sky, ducking and diving in and out of the clouds. Jake can't catch his fish with a crooked copper nail, or tempt them down with food, or grab them in his hands. Then Jake learns the magical power of words. 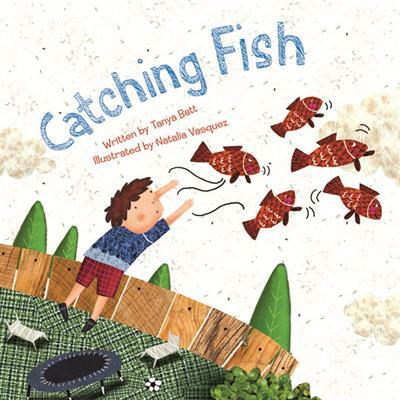 Tanya Batt is one of New Zealand's top storytellers and is also a published author of both fiction and non-fiction. Tanya travels the world performing stories to delighted audiences of young people - and the young at heart! A trained teacher, Tanya's approach to the children in her audience keeps them not only entertained, but mesmerized by her stunning performance. Tanya's writing is both child-friendly and sophisticated all at the same time. Her stories are magical and quirky and, coupled with the choice of high-quality illustrators, will make beautiful picture books for the Reading Alive imprint. Natalia Vasquez grew up in Peru and studied painting at the Fine Arts School of Lima. She has been working as a freelance artist since 2003. Her children's illustrations are quirky and modern and have a special appeal to young readers. Natalia's art features in children's books internationally, although she lives and works in Peru, with two lazy drooling dogs as neighbours.